There is no mention of the force. Barely a lightsaber is wielded. In these tangential Star Wars stories Disney has somehow figured out how to not only expand a brand, but simultaneously how to sell what were once mid-range, star-driven vehicles that have more or less become obsolete in the current theatrical landscape of tentpole after tentpole. It makes sense: to be not what everything else is, but what you need to be sometimes means taking up the mantle of that which will make people feel the urge to venture out to the theater while ultimately delivering something they didn't know they missed seeing on the big screen. And so, Solo: A Star Wars Story is a heist film that just so happens to feature characters with names and a few locations a few of us might recognize. Moreover, these characters may not require further backstory or exploration as this may in fact be detrimental to the mythos of some while fascinating in other circumstances, but in this universe as it now exists both the recognizable and additional characters on display here all have their own stories that can be expanded upon and thus is the reason LucasFilm and Kathleen Kennedy no doubt found this a solid if not necessarily wholly compelling piece to produce in the beginning phases of these extraneous stories taking place around the core trilogies. Because of this and because of Disney's inability to add any genuine stakes to Solo given it takes place prior to the original trilogy and they've already spoiled what happens to the character after; the studio has been afforded the opportunity to make a Han Solo movie which isn't really as much a movie about who Han Solo is and why or how he became the Han Solo we all came to know and love in Star Wars, but more it is a movie about a team of scoundrels and smugglers who are always seeking that "one job to end all jobs". You know, the one they might retire on, settle all their debts with, and that will set them up prettily for the rest of their lives? Yeah, that's what Solo is. 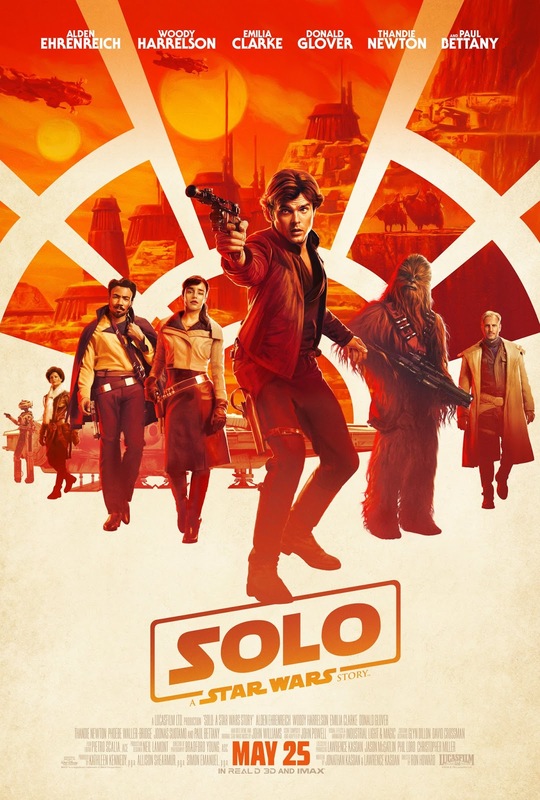 Solo is a mob drama of sorts, albeit an intergalactic one, that by default functions as part of two specific genres and works well enough to varying degrees in both for the general effect that it suffices to satisfy audiences seeking either type of movie just well enough. Does it hold much weight? No. Was it necessary? Of course not. Worst of all, it's not very efficient with its own storytelling in certain acts, but it's a fun enough time with characters that, if you loved them already, you won't mind hanging out with more and getting to meet some of their extended circles you weren't acquainted with prior. 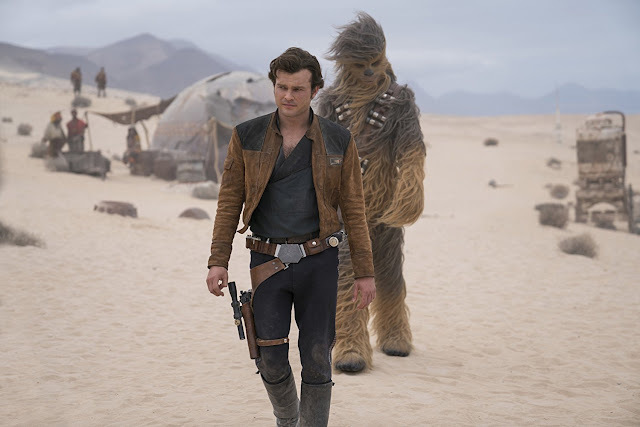 Han Solo (Alden Ehrenreich) and Chewbacca (Joonas Suotamo) find themselves in yet another unusual predicament. We begin not with a crawl, but with what is still prefaced as taking place "a long(er) time ago in a galaxy far, far away..." We are told this is a "lawless time" and are then set down on the planet Corellia, a shipbuilding world, where our titular "hero" (we'll come back to that later) was presumably born and raised. It is also a place run by scum that goes by the name Lady Proxima (voice of Linda Hunt) who has commissioned the young Han (Hail, Caesar! 's Alden Ehrenreich) to steal what is known as "Hyperfuel". Meanwhile, Han sees this rare and valuable element as a way for he and his girlfriend, Qi'ra (Emilia Clarke), to finally be afforded the chance to flee Corellia. In one of those moments that will forever change the course of their lives, Han is able to narrowly escape Lady Proxima's henchman, but Qi'ra is apprehended just before she can step into freedom. Han quickly enlists in the Imperial Navy as a flight cadet in a scene I can't decide if I liked or not, but that would seemingly be a monumental moment were everyone's opinions not already informed by everyone on the internet's opinions. I want to believe this scene in particular is a nice touch with swell intent even if it is a little on the nose, much in the same way I want to like Phoebe Waller-Bridge's featured droid in this Star Wars story, L3-37, is but despite being wholly her own character and different than any droid we've seen before in a Star Wars film her characterization feels so pointed in its agenda so as to often times come off as obnoxious rather than as this liberating force she is meant to represent. This is jumping ahead though, as L3 isn't introduced until after Donald Glover's Lando Calrissian comes into the fold which, as many I expect will be disappointed to hear, isn't until around the fifty-minute mark of the film. This is jumping ahead of the fact the film itself actually jumps ahead three years after Han makes it off Corellia and winds up inadvertently hanging out with a gang of criminals posing as Imperial soldiers led by Tobias Beckett (Woody Harrelson), his girlfriend and explosives expert, Val (Thandie Newton), and their pal and pilot Rio Durant (voice of Jon Favreau). Han and his newly acquired friend, a wookie named Chewbacca (Joonas Suotamo)-you may have heard of him, blackmail their way into Beckett's crew and are soon hijacking a shipment of that aforementioned hyperfuel coaxium on the planet Vandor. As these things go though, nothing goes as planned and given Beckett is in deep with crime lord Dryden Vos (Paul Bettany) who runs a syndicate known as Crimson Dawn Han, Chewie, and Tobias have a lot of explaining to do when Vos shows up to collect his goods and they don't have them with the fact Qi'ra now works for Vos only further complicating things. Written by Empire Strikes Back and The Force Awakens scribe Lawrence Kasdan along with his son, Jonathan, there was hope that this guy who'd had a hand in some of the title character's most iconic moments might lend his origin story some real weight, but while Kasdan obviously has a love and a passion for the character of Han Solo what he and his son have concocted for this film in particular holds no gravity and instead operates on a handful of those previously mentioned genre cliches that amounts to an entertaining enough time in the moment, but contains nothing to earn its name alongside fellow pop culture milestones born from the original trilogy. It is in the screenplay that we probably find the most disappointment as it was the one seeming constant throughout what is now a famously storied behind the scenes saga. As you've no doubt heard, director Ron Howard (Apollo 13, A Beautiful Mind) was brought in after head of LucasFilm, Kathleen Kennedy, essentially fired original directors Phil Lord and Christopher Miler (The LEGO Movie, 21 Jump Street) over what was once again deemed to be "creative differences". To this point and now having seen what Howard, Kasdan, and LucasFilm delivered it is difficult not to wonder what exactly Lord and Miller might have produced and how it might have felt more vital and necessary than this fine, but forgettable adventure film. If Lord and Miller were able to bring actual gravitas to a movie about toy blocks one can only imagine what they might have done with the origin story of one of the most notorious scoundrels in the galaxy; opening up the movie to explore more the why of why Han Solo is who he is when we meet him in Star Wars, rather than simply re-capping the how of how he arrived on Tatooine in the circumstances we all recall-which is what it feels as if Solo has done by the time the credits roll. There are certainly scenes to suggest layers to our titular character, but this goes back to the issue of the script as the Kasdan duo are able to highlight a context and set of circumstances early on from which Han was born and grew-up in that suggest his disposition as a loner and outsider, but as the full set of events chronicled in the film unfold it more becomes a sense of this happened and then this happened rather than this natural sense of provocation in which Ehrenreich's Han Solo becomes Harrison Ford's Han Solo. It all makes sense in dramatic terms as this young-ish version of Han (Solo supposedly takes place a decade prior to the events in A New Hope) is taught lessons of perspective and betrayal that lead to him falling in line with neither the Empire or emerging rebellion, but rather set-up both his dissenter attitude as well as the dynamic he carries with characters audiences are both seeing for the first time and have seen before. In fact, this may be the strongest aspect of this A Star Wars Story as Clarke's Qi'ra offers our most intriguing character arc and Glover's iteration of Lando and his interactions with Han are some of the most entertaining moments in the movie. Lando Calrissian (Donald Glover) plays his hand at Sabacc prior to meeting the titular character. The fact that the film is so plot heavy and thus less naturally evolving is what ultimately makes Solo more of a chore than an inherent piece of the puzzle, but that isn't saying the movie doesn't offer some interesting new spins on the Star Wars universe or that it does nothing of value. This is by no means a bad movie it is simply a "good enough" one that doesn't zero in on the meat of why Han Solo has always been an intriguing character that being his duality. Though often thought of as a reluctant hero; a man who places his own welfare and well-being ahead of the greater cause, but allows his good side to prevail largely due to the relationships he forms with those around him Solo somewhat upends this and paints Ehrenreich's version of the character as an optimistic and persistent individual who seems to always have the bad luck of being or ending up in the wrong place. Ehrenreich's Solo doesn't need to be convinced to help, but rather he is already on this course of obtaining an objective that was seemingly a given in his life before being thrown off track and becomes this somewhat naive, but still charming and effectively convincing rogue that will do whatever he needs to return to that course. Sure, the Han Solo here is still very much looking to make a score and looking out for his best interests, but it is the end goal being made visible that changes our perspective on how the character might evolve from Ehrenreich to Ford's portrayal. In Solo, Han still isn't your typical hero, but he is going out of his way to ensure he can rescue the girl and allow them to henceforth live happily ever after. Ehrenreich exudes the necessary qualities with which to convey this slight change in tone and his chemistry with Clarke is what makes the film as involving as it is despite shortchanging the audience when it comes to the arc of each of their characters truly beginning to become interesting. The same can be said for Ehrenreich and Glover's chemistry and charisma as the first hand played between the two in a game called "Sabacc" is genuinely great and gives the movie its first real boost of energy after an hour of plodding through plot in order to unite each of the characters it wants to have form this core cast. With the appearance of Glover's Calrissian as well as the much-hyped performance Glover was expected to give, Lando is not actually in the film a lot and is only as good as he is due to the fact he appears in small doses. 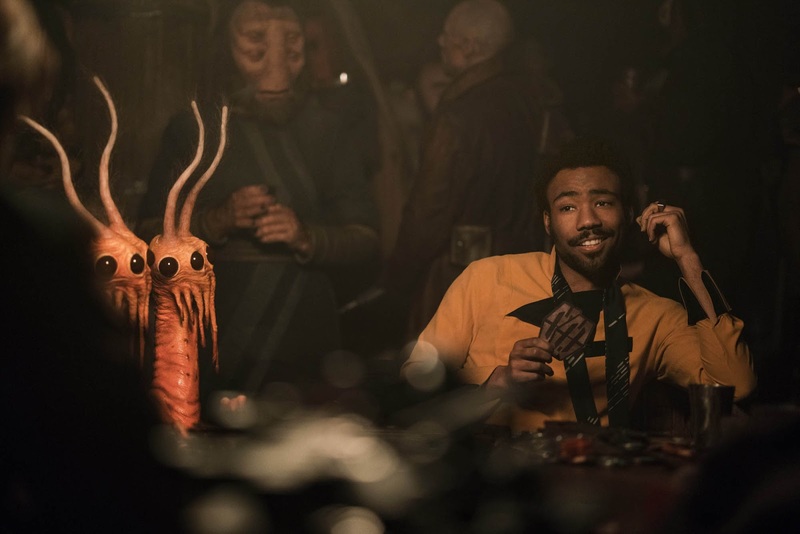 Glover is doing (much) more of an impersonation of Billy Dee Williams than Ehrenreich is of Ford and if, as rumored, Glover is requested to do an entire movie centered on Lando it would be difficult to see how the audience might not be tested by or find sympathy with him. Solo: A Star Wars Story looks, sounds, and feels different than any other prior Star Wars film with cinematographer Bradford Young (Arrival, Selma) really owning the look he's chosen as John Powell's score certainly includes some of those iconic orchestral moments, but also deviates from what our ears have been conditioned to. Otherwise and aside from those previously noted highlights, the Han/Chewie introduction is a perfectly concocted moment and there are thick chills laid when Han gets his first look at the Falcon. If nothing else, Solo serves as another interesting entry in the now long-running history of this ship as we've seen where it's been and where it's gone, but apparently there are still plenty of places it's going and have been that we've yet to see...much like the Star Wars franchise itself these days.